As I walked to join the #GreatToryTrainRobbery protest at Stratford Station early on Monday morning, I was listening on earphones to Chancellor George Osbourn, being interviewed on Radio 4 news "Today". Osborne blithely announced a further £25 billion in welfare cuts after 2015. When it was suggested that since payments to pensioners cost half of all such welfare spending he should be cutting winter fuel allowances to wealthy pensioners, he said that this would only save a few millions. He suggested instead the savings will be made by further cuts to young people's housing benefit and by charging more to Council tenants who earn £60-70k per year. It was raining quite hard at the time and was too windy to put up an umbrella (not the best day to start fulfilling a New Years Resolution to walk everywhere) but this helped cool me down while listening to this nonsense. The Government has already restricted housing benefit to a room in a shared house for those under 26? Not all kids have middle class parents with spare beds to fall back on if they become unemployed or sick. Remember who introduced bedroom tax and got rid of spare bedrooms? There is a tiny, tiny number of Council tenants (why only Council tenants? what about housing association tenants? Does someone like him know there is a difference?) who earn that amount of money. There is an argument about increasing their rent levels but I thought Tories were against means testing? Housing Associations have been given the power to charge variable rents but have, by and large, decided that it would be more costly and bureaucratic to implement than they would gain. Frankly we need more better paid tenants living in social housing. We don't want benefit ghettos or private gated estates - we want genuine mixed communities with headteachers, entrepreneurs and doctors living alongside the retired, the low paid and the unemployed. None of above is going to save £25 billion. The "Today" presenter gave Osbourne a hard time over his claims but like nearly everyone in the media, seems to accept that there is no alternative to cuts, cuts, cuts? What about increase in taxation for those wealthy enough to pay? I had cooled down by the time I got to Stratford (aka soaked). 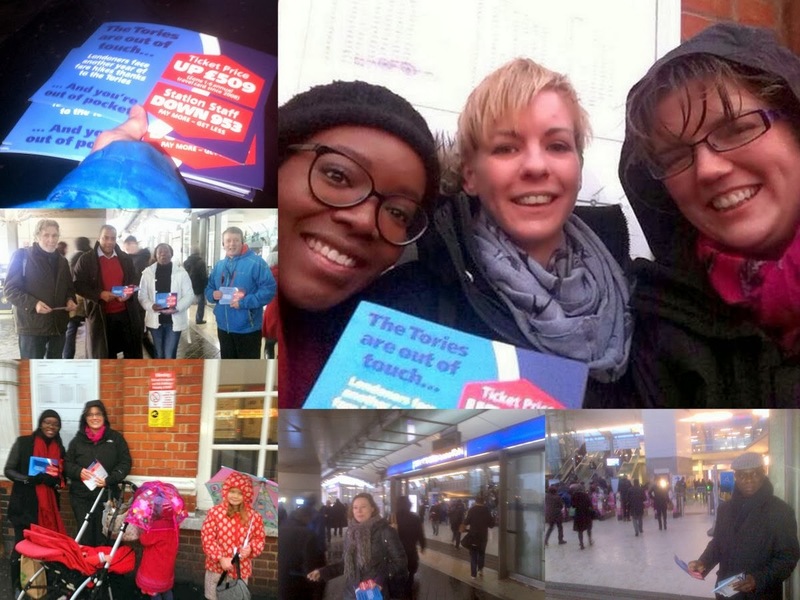 West Ham Labour Party CLP had organised leaflet protests against train and bus fare increases outside Stratford, Forest Gate, Canning Town and Royal Docks stations (see photo collage). London has the highest public transport costs in the world. Fares under Tory Mayor Boris are rising 3 times more than wages. He is also getting rid of the staff who keep passengers safe late at night. This year's protest was at stations all over London and the South East. It was also the first day back to work after the holiday for many workers. Fittingly, it is called "Blue Monday". I hope people in this years May election remember Osborne and the Tory fare increases of Blue Monday and vote Red.